In this review, we’ll take a look at the best zipperless suitcases that are currently available on the market. If you’ve never owned a zipperless suitcase, and the security of your luggage is important to you, then you have come to the right place (ah, review). There is one big reason why zipperless are better than the good ol' zippered suitcases. They are way harder to break into. It may seem a bit weird, but it's just that no one realises. But more on that below, along with the best zipperless suitcases! 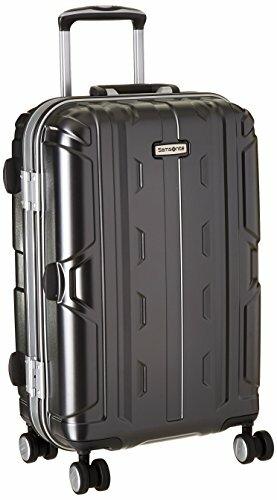 Which Zipperless Suitcase Is The Best For Me? You may not realise but a standard suitcase zipper can be opened incredibly easily, regardless of any locks or precautions. All you need is a standard ballpoint pen, and you can defeat any zipper you can find. You just insert the pen between the teeth of the zipper and they come apart – easy as pie! Not a surprise really considering that is what they are meant to do that. After a thief has managed to open up your suitcase, they can then do whatever they please with your belongings. Once they is done tampering with your luggage, they would simply pull the zips over the open part and voila; the bag is closed again. This method leaves no evidence, and you most likely wouldn’t figure out anything was out of the ordinary until it was too late. Another interesting problem when you travel is - you are responsible for the contents of your suitcase, regardless of how they got there! Shocking, I know. That is why so many people wrap their cases in plastic at the airport. So, if you want to do everything in your power to ensure that you and your luggage arrives safely at your next destination (especially if you travel a lot), then a zipperless suitcase would be a smart investment. Let’s take a look at what you should consider when purchasing one. 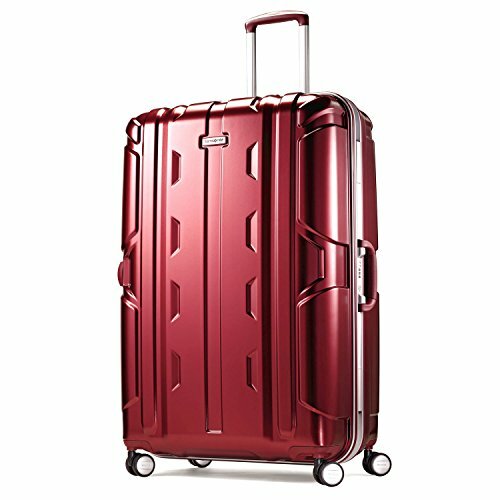 The F’lite GT Spinner is also a solid choice, when it comes to zipperless suitcases. 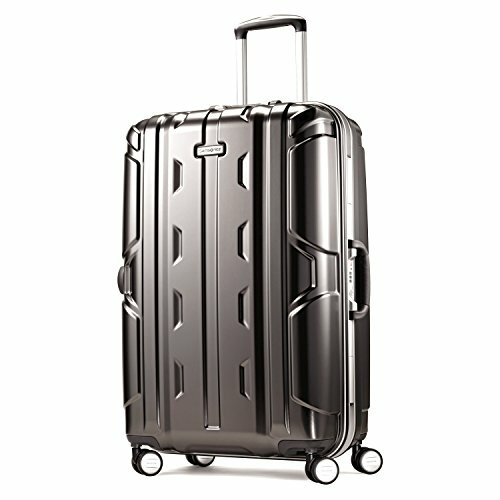 It’s another hardshell suitcase that you can get in 2 different sizes – 28” and 31”. 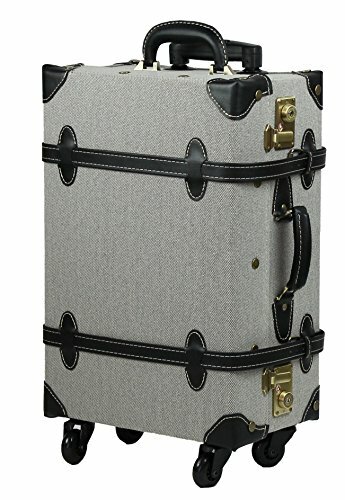 28" x 10.5" x 20"
31.0" x 21.0" x 12.0"
This suitcase is great for anyone who travels for longer periods of time. Both versions are pretty big and roomy, so if you always have to carry a lot of stuff with you, this is a great choice. It also has spinner wheels, which will make carrying it around much easier. The F’lite GT Spinner is made of 100% polypropylene, which is another lightweight material. In addition to that, there is no lining in this suitcase. Some will consider this a bonus, others won’t, but we can all agree that it’s another good strategy to make the suitcase as lightweight as possible. What about the lock? The F’lite GT Spinner is equipped with a Mounted Travel Sentry combination lock. It features a three-pointed closure system that will give you some peace of mind, when it comes to the security of your luggage. And, it’s also TSA approved – another big plus in my book. The Andiamo Elegante Suitcase is equipped with a TSA approved combination lock. You can easily set up the combination by switching down the plug that is inside the suitcase. 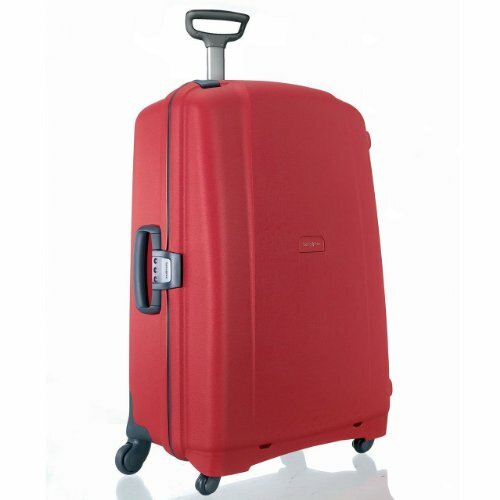 It also has double spinner wheels, which will give you incredible maneuvrability of your suitcase. The inside of the suitcase is also lined with plush jacquard lining. The top part of it features 2 zippered mesh pockets for some smaller items, and the bottom part features adjustable straps for securing your belongings. What bothered me about the top part of the Andiamo Elegante is that it cannot be fastened with a zipper. Instead, there are two hooks that secure the divider in place. This isn’t necessarily a bad thing; I just think zippers do a better job of keeping everything in place. It's a personal choice in the end though. 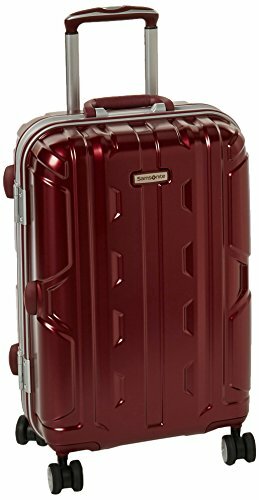 Samsonite has always been among the top suitcase manufacturers, and this is true also when it comes to the zipperless ones. The DLX Hardside Spinner is currently available in 3 different sizes – 21”, 26” and 30”. You can get any one of these in 2 different colors; Burgundy and Anthracite. 26.0" x 17.0" x 11.0"
30.0" x 20.0" x 12.0"
This suitcase is also framed with aluminum, so it’s sturdy enough to endure being thrown around by baggage handlers. Once you open it, you get two compartments lined with nylon. One compartment features cross straps, and the other one can be secured with hooks. The DLX Spinner also features double spinner wheels (hence the name) that are always a big plus in my book. Now, you might be asking yourself, what about the lock? Well, this Samsonite suitcase has a combination latch lock. You can set up the combination yourself, and you’ll be the only one with the access to your suitcase. Well, since the lock is TSA approved, TSA agents will also have access to it. But I consider that a plus – if your luggage should need to be inspected, they can do so without forcefully opening and damaging your suitcase. The S'Cure is another great zipperless choice from Samsonite (they seem to make a lot of them). It's not the sexiest suitcase on the market, but it is super solid being made of lightweight but strong Polypropylene. As you would expect there are 3 main sizes of this model (20, 28 and 30 inch) as well as 4 quite bright colors (red, light & dark blue, and black). 19.5 x 14.5 x 7.8"
28 x 18 x 11.5"
30 x 20.7 x 13.8"
This suitcase is the usual clamshell design, which means you can pack smartly across two sides. On the one side you have an open section with criss-cross straps to keep your clothes secure. While on the other, you have a cloth covered zippered section. This is great to put your smaller items that are not as sensitive to creases, or your lighter items (as this is usually the upside-down top part). The locking system is a 3-code TSA approved lock that would require some decent leverage to break (instead of just a pen, like with zippered luggage). The wheels are dual 360 degree spinners for easy, and reliable rolling, or tilting on rougher terrain. The telescopic handle has only two positions (to be expected for a less expensive Samsonite, their more expensive often have multi-position) which lock into place for easy pulling. All in all this is a workhorse of a suitcase, with nothing too fancy, but it keeps it light, long-lasting and reliable. You can read our full review here. Just look it at it. This suitcase is a combination of vintage design and modern technology. With The Moierg Vintage Suitcase you really will stand out. It’s available in 16 different colors, which really surprised me. And, it comes in 3 different sizes – S (17”), M (19”) and L (23”). On top of that, the way that it looks, both inside and out, are sure to make you, and your luggage stand out no matter where you travel. It is made of PU leather and it features metal connectors. The corners of the suitcase are padded, to protect it form any damage. Once you open the suitcase, there isn’t too much room for your stuff, though. The problem is that the handles protrude into the bottom part of the suitcase, which leaves you with less room for your things. In addition, the upper part features a pocket for some small items (jewelry maybe), but it cannot be completely closed. And, you cant pack anything in the upper part of this suitcase. In terms of modern technologies that the suitcase features, there’s the TSA approved lock (that you lock with keys), as well as the telescopic handle and wheels. The wheels, however, don’t turn 360 degrees each, which is somewhat disappointing. 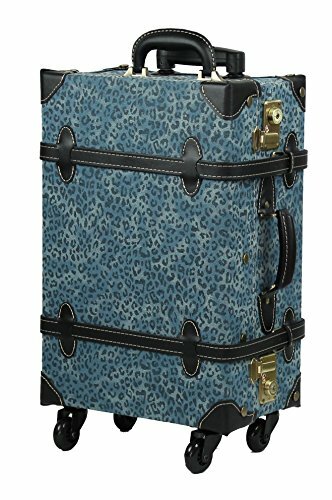 Overall, this suitcase is great for someone who doesn’t travel a lot, but wants to do so in style. If you are looking for something more practical, rather than stylish, I wouldn’t suggest the Moierg Vintage Trolley. 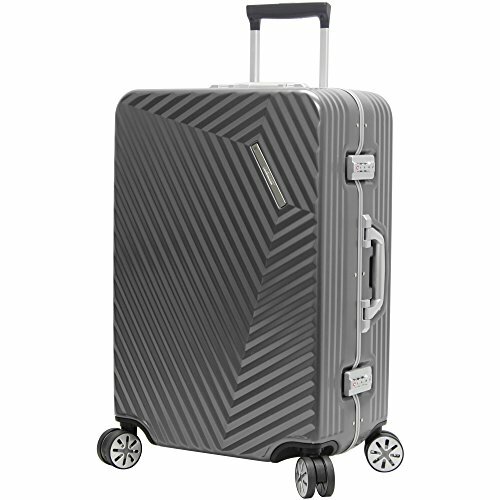 When it comes to Aluminium zipperless suitcases Rimowa has been making them for decades. In fact, most of the ones you see at the airport are inspired by this one. It's super-strong, often hand-built in Canada, and is something you invest in and use for years to come. 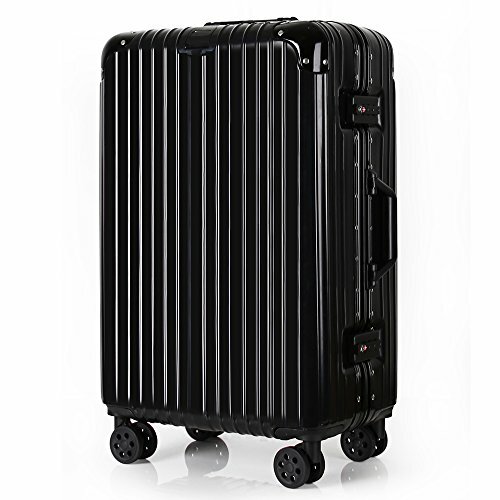 This is just one of the many models they have, another we have reviewed before is the more expensive Rimowa Topas. This suitcase is all about quality and style. The side handles are made of leather, and the interior is not only lined with plush, protective material, but one section has a height-adjustable panel for easy packing. 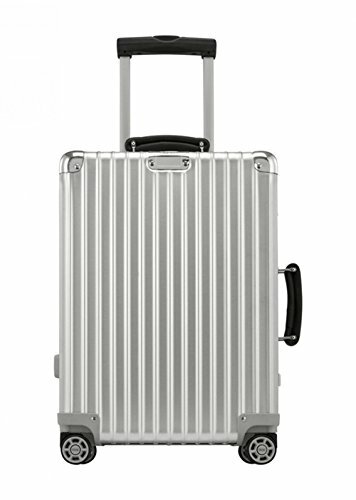 The team at Rimowa have left no stone unturned, which is why this is an expensive case. However, if quality, durability and reliability are what you are after, then this is the one for you. The suitcase is made of lightweight ABS+PC material, and the frame is also reinforced with aluminum. 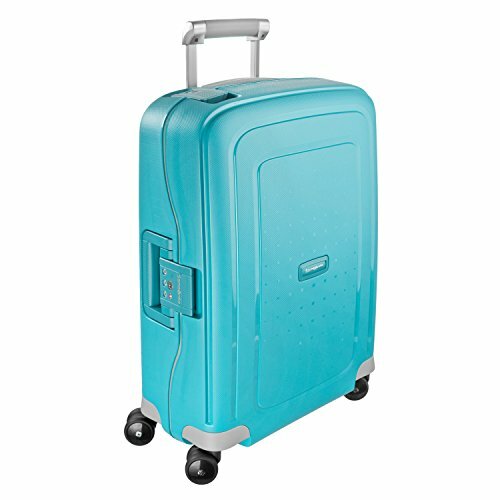 In terms of durability, this suitcase is waterproof, heat-resistant and impact-and-strike-resistant. 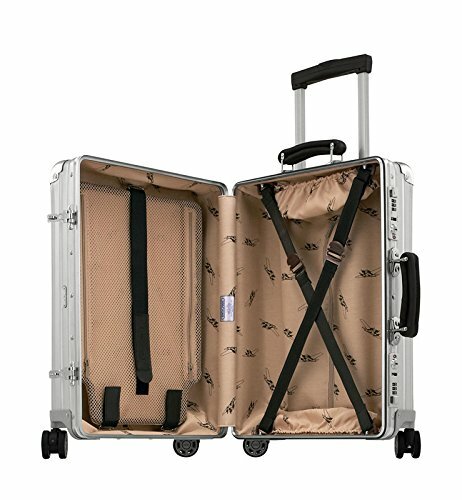 In terms of its insides, it has dividers on both the top and bottom part of the suitcase. The dividers are secured with hooks, and they have multiple zippered pockets for your smaller belongings. This is a big plus for anyone who really cares about organization of their luggage. 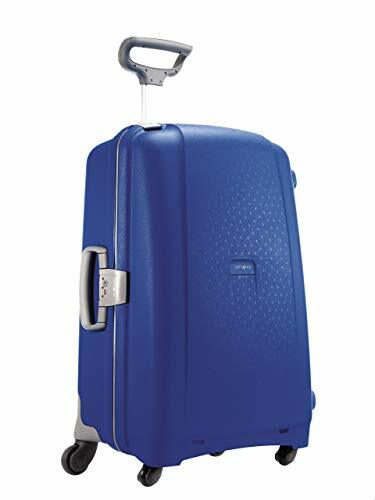 Other cool features of the Togedi Lightweight Luggage are the double spinner wheels (with a cap that is the same color as the body of the suitcase), a 3-step telescopic handle and the TSA approved combination lock. Actually, there are 2 aluminum TSA approved locks on this suitcase, so you can have absolute peace of mind when it comes to the safety of your possessions. Everyone has different needs, when it comes to the size of their luggage. People who usually go away for longer periods of time naturally need bigger suitcases than people who go away for a couple days at a time. So, have a good think about what your specific needs are before you starting checking out prices. 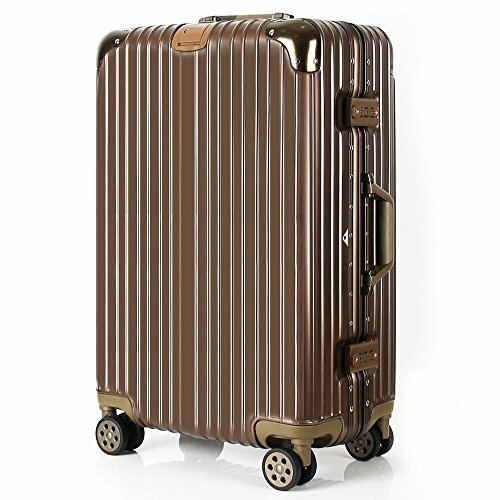 All the suitcases featured in this review are available in several different sizes, so you can choose the one that fits your needs perfectly. However, if you travel a lot, you’ll also want to make sure that your suitcase is lightweight, to avoid any extra fees when checking your luggage. And, sore arms from having to push it around all the time. Therefore, be on the lookout for “lightweight” in our pros section if this is important to you. Although they can get heavy, suitcases with decent wheels can make this task significantly easier for you. In case you have not come across the definition yet: spinner wheels are wheels that turn 360 degrees each. This means that you can both push and pull your suitcase, and also that you don’t even need to tilt it. These types of wheels roll no matter what situation they are in. Therefore, if you do usually carry a lot of luggage with you on your trips, be on the lookout for “spinner wheels” in the pros section of the products. They are a lifesaver. Can you pack both the top and the bottom part of the suitcase? Are there dividers on both sides, or just on one? Are there additional pockets? These are all things that you need to consider when purchasing a suitcase. Organization is very important, and it goes a long way in helping maximize the limited space you have. 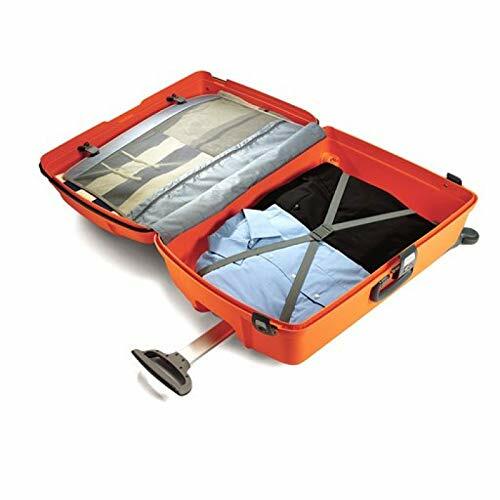 Dividers secure the contents of your suitcase, and they can be secured to it with either hooks or a zipper. They also usually feature pockets for your smaller possessions, but sometimes they have just one big pocket. I much prefer it when there are several smaller pockets, because they make the suitcase less bulky. So, be on the lookout for “divider with one pocket” in the cons section. Well, that largely depends on your needs. Personally, the winner for me is the TOGEDI Lightweight Business Travel Luggage. It’s lightweight, practical and it has a ton of organizational features, which is a big plus for me. The only downside to this suitcase is that the largest version is 28” – a 31” version would really complete their range. Best of all, it is available in Rose Gold. 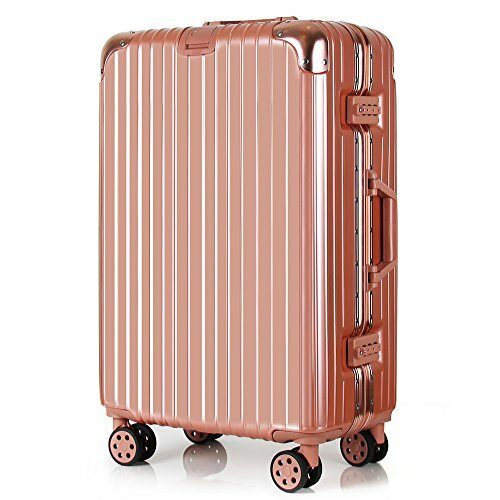 I don’t know if you’ve noticed, but rose gold is the hottest new color, so if you want to travel in style, then this is the suitcase for you. And the 2 TSA approved locks will keep your mind at ease your entire trip. 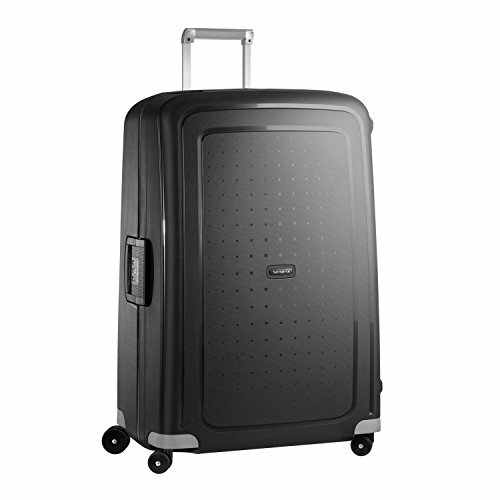 A close second is the Samsonite DLX Hardside Spinner. If only they made it in rose gold, right? Jokes aside, you can rarely go wrong with a Samsonite suitcase, and this one is no different than the rest. Spinner wheels, TSA approved lock and an aluminum frame are just some of the features designed to make your life easier, and your travels more enjoyable. 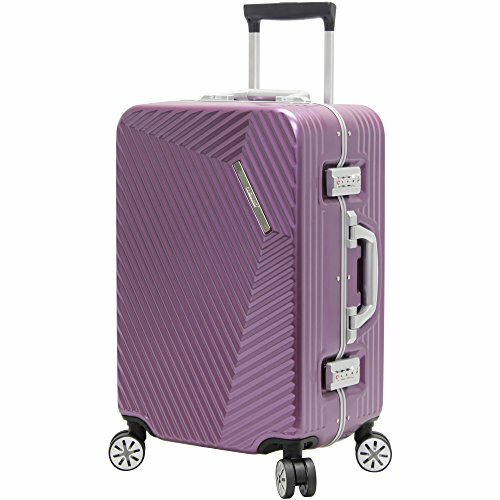 The Andiamo Elegante Luggage is also an option worth considering. 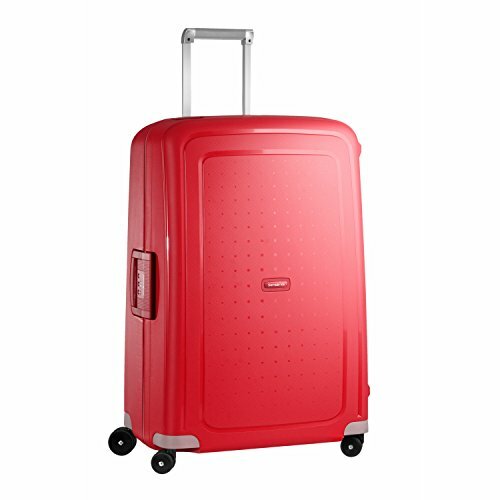 It’s available in 3 different sizes, and it has pretty much the same features as the Samsonite one. It is only slight worse than the DLX Spinner because it scratches more easily, but that does not affect its performance at all. Itegrated TSA locks recognized as the standard throughout the world. Easy gliding 8 wheel spinner system that enables optimum maneuverability and motion. Whichever one you choose, I’m sure you won’t have any regrets. 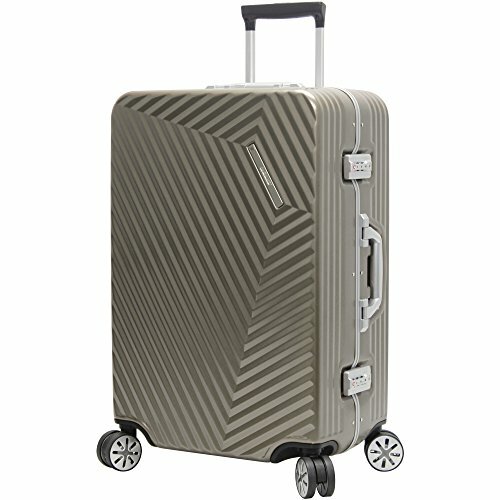 Head on over to Amazon to get a great deal on any one of these zipperless suitcases!